FREE with your purchase of $50 or more! NEW & EXCLUSIVE Wondering where your next favorite legal or crime series is coming from? Just look down under. 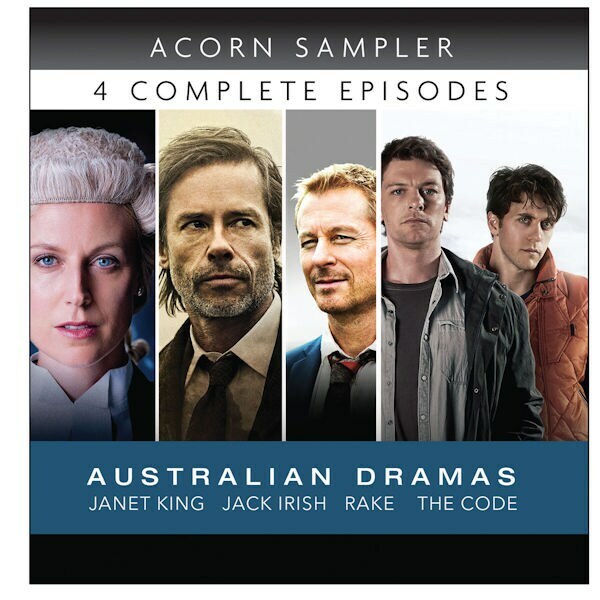 Discover four award-winning, binge-worthy Australian programs with this exclusive Acorn omnibus, free with any $50 purchase. Each of the four hour-long episodes included here is the first in its series—and is presented in its entirety! In the cinematic noir series Jack Irish, Emmy® winner Guy Pearce (Iron Man 3) is a former criminal lawyer turned private investigator. Marta Dusseldorp (A Place to Call Home) plays the title role in the gripping courtroom drama Janet King—a senior crown prosecutor who unearths a scandal within the police and judiciary. In hit comedy-drama Rake, Richard Roxburgh (Moulin Rouge!) plays a brilliant barrister battling self-destructive tendencies. Cyber-thriller The Code stars Lucy Lawless (Battlestar Galactica), Dan Spielman (Deep Water), and Ashley Zukerman (Manhattan), and follows two brothers as they unravel a high-tech political conspiracy. 4 episodes, 4 hrs, 1 DVD, SDH. Mature Content.